Have the upside. Hedge the downside. This will be the final general Brexit trading update – after this will resume general separate trade updates, but just wanted to get down all the trading moves made since last Friday and this week. In summary it is a political mess in UK following Brexit. Prime minister resigned, opposition leader under threat for not campaigning strong enough for stay vote and Scotland threatening to veto the decision. On top of that Europeans telling UK to get on with a timetable for leaving. Not to mention the final hammerblow of England losing to Iceland in Euro 2016 (Brexit likely not as traumatic as the football exit for some people…). However .. on to the trade update. If your trading account is still alive after the last few days after brexit… Congratulations! We were NOT expecting a leave vote to win, however we have to adjust our positions. Fortunately the implied volatility is still sky high on currencies and equities, so adjusting by selling premium is not that hard. We are now now bearish USDGBP for the next few months. Not betting on immediate rebound. Any rallies are to be sold. There will probably be huge counter trend rallies based on discussions or actual BOE currency intervention, however those should be taken as a opportunity to short at higher levels. Limited risk reward with all bearish trades (eg call spreads or put / put spreads). Also medium term bearish on UK equities, but fallout from US equities will almost certainly be less for US versus UK. Not convinced that US market will react dramatically to Brexit over next few months (isn’t not likely on it’s own to cause a bear market). Would like to do short premium trades that take advantage of the high implied volatility env. Once again… if your trading account is still alive after the last few days of trading brexit your risk management rules are working. Hedged our entire GBP cash position with a combination futures trade. This was hedged at 1.385 into the bounce on Friday morning at much better prices than overnight. The combination /6B futures trade was needed to have full downside protection – without over paying TOO much for volatility (although some volatility premium needed to be sacrificed to hedge against total free fall). Added these two bearish trades with a SPY put butterfly in the morning and IWM put butterfly near the close. These have no downside risk and were added when vol was high so could get strikes wide apart. Hedged our entire Canadian dollar real estate position with a combination futures trade. This might be an over reaction to Brexit because the Canada/USA economic trading relationship is not likely to be directly affected. However if the market goes into “risk on” mode and oil prices decline then the USDCAD rate would suffer. Sold a QQQ iron condor similar to Tasty Trade’s good trade / bad trade – not our idea, but will take it. Short TLT bond call spread – don’t really like this trade from risk/reward (doesnt make much even if right) but just trying to sell bond premium in high vol with limited risk (and start a very small short position at recent all time highs). 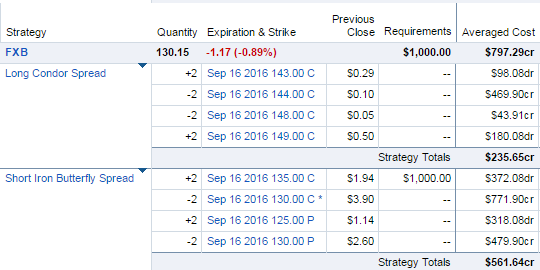 Didn’t do much because implied volatility had contracted quite a bit, so there wasn’t that much premium to sell. Still not happy with QQQ and TLT positions – slight rise in market or bonds is going to hurt these positions. Didn’t do much, big market rally again. Implied volatility reduced again. Sitting on hands for now. GBP rally somewhat muted given general “risk off” market rally. Portfolio is now getting too short for comfort – we have also iron condor established early in June in XME, EWZ that are rallying hard through the short call strike today. Adjusted the QQQ iron condor established on Monday to get some more long deltas in the portfolio. Handled the actual event pretty well, but was caught off guard a bit because do not expect this massive bounce. Lost about 1% of the account in the bounce because pushing too hard on the short side (but that was arguably justifed given the initial market reaction). Ironic though because through out actual brexit in about Monday – the account was flat to slightly up. So navigated it pretty well initially, but frustrated to be losing money in last couple of days when did so relatively well on the initial reaction. Live and learn – and definitely not a write off experience. This entry was posted in Futures, Options, Trade Adjustment, Trade Entry and tagged /6B, /6C, FXB, IWM, QQQ, SPY, TLT by 30DayTrading. Bookmark the permalink.